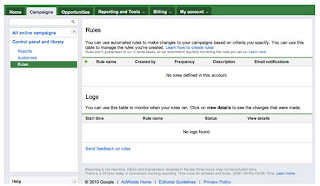 Google Automated Rules Beta, Stay Tuned. Have you ever had to wake up early on Black Friday, when you are supposed to have the day off work to switch over your search ads to holiday creative? Why can’t your ads be set to automatically turn on and off? Google has just rolled out Automated Rules Beta, which will now allow you to automate a variety of different manual processes that were not previously feasible. Note that you must be whitelisted for this beta and it is not yet available for every account. 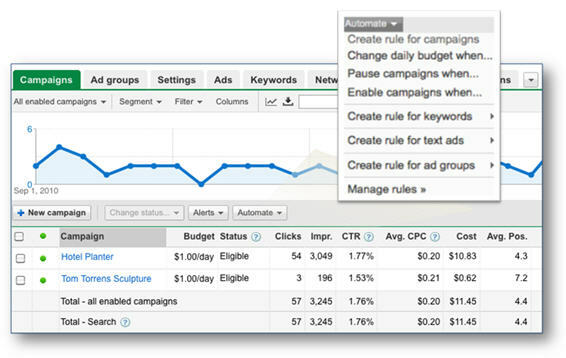 Google’s automated rules allow you to schedule bid, budget and status changes to a campaign, ad group, ad text or keywords when a certain criteria is met. Aside from setting holiday creative to turn on and off, you can set keyword bids to automatically increase if your quality score drops below a certain point. 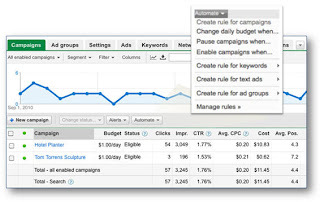 You can also have your campaign budget increase when your click through rate increases to a certain point, you can have certain ads pause if the click through rate drops below a certain point and you can do a variety of other automated campaign changes. The only complication I have noticed so far with the automated rules is that it can get complicated and time consuming. 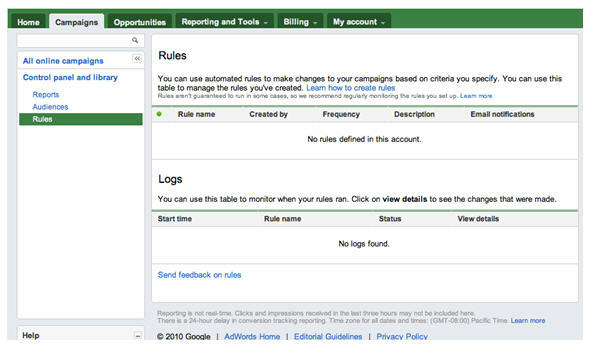 There is no way to make bulk changes for automated rules and everything has to be done in the online AdWords interface. If you want to set certain ads to go on and certain ads to go off on a certain date, then you have to create two separate rules. One rule will turn ads off and the other rule will turn ads on. 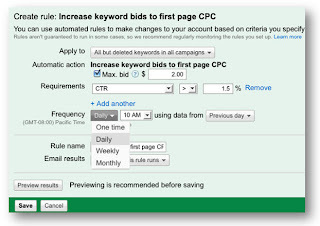 For both of these rules you will have to manually select each individual ad in the AdWords interface. 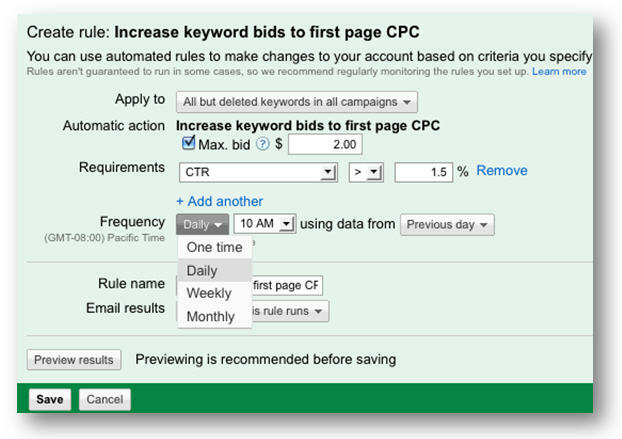 Like most beta features, you cannot access Automated Rules through the AdWords desktop editor. I would not recommend creating automated rules for all everyday tasks, given that a computer does not have the capabilities of the human brain. The quality scores and click through rates should still be looked at daily with the human eye. Preview your rules results before implementation to avoid any unintentional changes. Also do a few test rules first to make sure that they are set up correctly to ensure that all of the changes that are made to your AdWords account are the changes that you intend to make. Reach out to your Google rep and get whitelisted for the Automated Rules Beta, sit back and relax!